The classic rose adds elegance to all crochet projects. Whether you add it to your afghan, beanie or purse, a rose is bound to bring out a nice feminine touch. 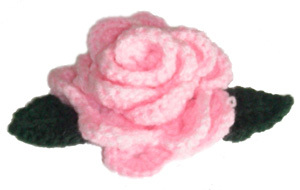 In this crochet pattern you can create a nice, large, full rose. Need extra help with this pattern? Check out the detailed explanation of the crochet rose pattern. repeat from * across, finish off. Row 2: ch 1, turn, sl st in next sl st, sc in next sc, hdc in next hdc, dc in next 2 dc, tr in next 2 tr, dc in next 2 dc, hdc in next 2 hdc, sc in next sc, sl st in next sl st, finish off. With yarn needle, sew leaves to rose using photo as a guide. You may also like to check out more flower applique crochet patterns. This set has 5 different flowers and 3 leaf sizes. 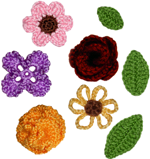 You can find more flower patterns at the Crochet Spot Store. If you have questions regarding this pattern, simply leave them here as a comment and I would be glad to help! This entry was posted on Thursday, February 12th, 2009 at 12:39 PM by Rachel Choi	and is filed under Best Crochet Patterns, Free Crochet Patterns. You can follow any responses to this entry through the RSS 2.0 feed. You can leave a response, or trackback from your own site. Barbara, you can use the print function in your internet browser. For most browsers you’ll click go to the menu bar at the top and click on “File” then “print”. Each page should print out nice and neatly, since they are all coded to be printer friendly. Rose: If you happen to use Google Chrome as your browser, go to the Drop Down under FILE and select Save Page As…. Good luck! I would like to know how I can get a copy of this pattern? Hi Rose, you can print the pattern directly from your internet browser. Look in your browser’s menu, and there should be a “print” option. In most browsers you can click on “file” then “print”. Hello Barbara, I am new to crocheting and reading instructions.and would like clarification on Row 1. When I work “across until 1 ch remains, From what point am I beginning the repeat. I can’t wait to start on making these! I wanted to check- if I use these on pieces, do you mind if I sell them? very easy but looks lovely. Thank you so much for sharing your pattern. Thank you so much for sharing your pattern! This is the prettiest rose I have made thus far and I am so happy to have found you! Thank you for helping to keep the craft alive. It is through thoughtful people like you that others are inspired to pick up that hook and learn to crochet. This was one of my first projects and I felt that if I could make something as pretty as your rose on one of my first few attempts, then I might as well keep on learning and now I have just finished my first sweater for a woman and have attached a few of your pretty roses. Thank you so much! THANK YOU THANK YOU soooooo much… I just made your rose as a practice rose. It came out so beautiful that I am going to put it and another together with your leaf pattern on a package of a baby blanket that is for a very wonderful friend of ours. I am going to put the roses on instead of a paper bow on the package. I am so happy to have found your pattern, again, THANK YOU SOOOO much. That’s awesome!!! I’m so happy that you enjoyed the pattern. I think it would look great on your packaging and will be very unique. I love this crocheted rose pattern! I’m making a bunch of these little roses to use for my bridal bouquet and decor for my wedding – they’re so quick and easy to make, and come out looking wonderful! Thank you so much for posting this pattern! So glad I found your rose pattern. I’m making up a bunch of them in different colors to go on a door wreath that I am making for a friends 95th birthday to go on her door at the nursing home. Thank you for sharing the patterns! I have been fighting to get better from a massive stroke. Before that some horrible pain in my back, but I still try! I have always liked crochet , etc! I will not stop trying! Thank you for all you, if others, I would not be able to remember how! Thank you !! Hi. Thanks for the lovely pattern. I just have a clarification question. So for row 3 – do I crochet only in the ch-2 space made by skipped ch-2 space in row 2? Or do I work in the ch-2 space also created by the V-stitch (ch 2 2dc, ch2 2dc)? Does my question make sense? In short, how many 9 dc petals should I have when finished? You will work into the spaces created by chaining 2 on row 2. Not the spaces created by skipping stitches. OK, that is what I did. Turned out great. Thanks so much!! !